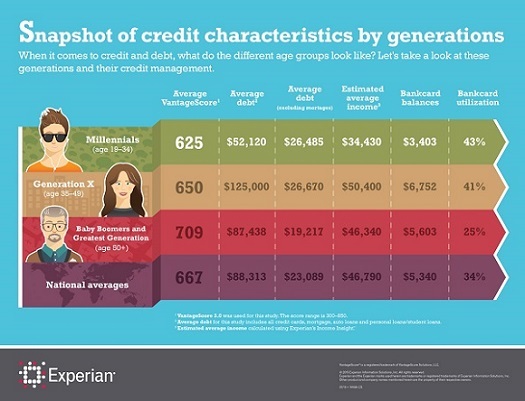 Millennials, also known as Generation Y (ages 19-34) are now the largest segment of the U.S. population, and according to a recent Experian analysis, also take the title for being the least credit savvy when compared to previous generations. The study revealed that millennials’ average credit score is 625, and their average debt excluding mortgages is $26,485. While their current financial picture may not seem so bright, they are at a prime age to establish great habits that will impact their credit future. With so many financial education resources available to help them, I believe that this generation is more empowered and informed than any previous generation and is positioned to be more successful if they make just a few good financial decisions now. Don’t be afraid of credit. Many millennials saw their parents hit financial rock bottom during the Great Recession and it created a fear of credit for this generation. It’s important to know the difference between credit and debt. Credit is a financial tool, debt is a financial problem caused by misusing credit. Using credit wisely is an important part of becoming financially successful. Don’t be car poor. 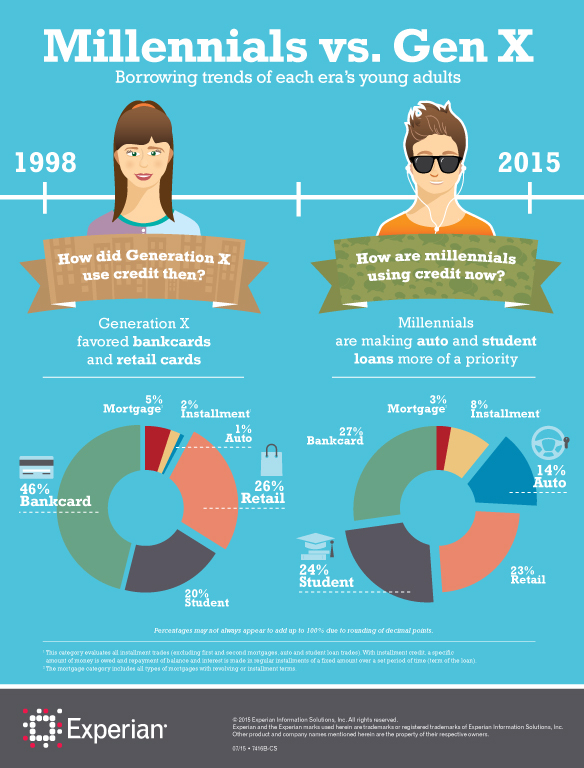 Millennials are purchasing cars at a much earlier point in life, which is giving them the opportunity to build credit a little differently than previous generations. Fourteen percent of today’s millennials carry an auto loan, compared with only 1 percent of their Gen X counterparts at the same age in 1998. My advice: don’t get more car than you need. Flash is fun, but usually expensive. Keeping it basic, and less expensive, will help you lay a stronger overall financial foundation. Go for the luxury, fully-loaded car when you are more financially secure. Don’t let student loan debt get you down. The high cost of college tuition has caused students to take on more debt than other generations. Student loans make up 24 percent of all new accounts for millennials, compared to 20 percent for their Generation X counterparts at a comparable age. Some critics question whether tuition debt is worth it. The answer is yes. Research has shown – and continues to show — that an education will pay off over the course of your career. Do keep in mind that there are options for where to get an education and costs vary widely. The average student loan debt is comparable to debt for an auto loan, between $25,000 and $30,000, but which one has better return on investment? Invest in yourself. If you think you will have trouble repaying your student loan debt, or already are, talk to your lender. Student loans often offer a variety of repayment options to help you manage the debt. Lenders may be able to work with you to create a payment plan that helps you keep making your payments on time, which is key to building a strong credit history. Don’t let “YOLO” and “FOMO” interfere with your budget. The average estimated income for millennials is $34,430 and their average debt excluding mortgages is $26,485. Be sure to have a written budget to help keep track of spending and what you can afford to spend on. A weekend music festival or a three month Euro-trip with friends requires saving and planning. A budget can help you reach those destinations and help you live a lifestyle you can afford. Delayed gratification takes willpower but the wait is usually worth it. Don’t ignore your credit report. Only 34 percent of U.S. adults have ordered a copy of their credit report in the past 12 months, according to the National Foundation for Credit Counseling’s 2015 Financial Literacy Survey. Reviewing your credit report will help you make sure it is in good shape when you are ready to apply for new credit. It also affects your credit scores, which are used to help lenders determine whether they should extend credit to you or not and the interest rate you may pay. By law, you’re entitled to get a copy of your credit reports from each of the three national credit reporting companies once every 12 months at no cost through AnnualCreditReport.com. 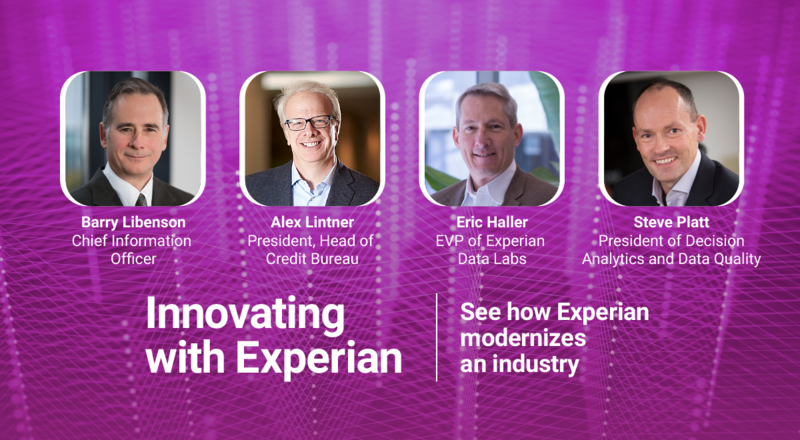 Click here to view the full study and check out more credit educational resources on our Ask Experian blog.